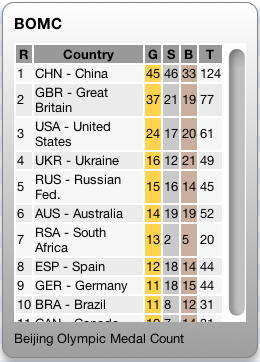 A Mac OS X Dashboard Widget written to display the medal count at the 2008 Beijing Olympics. As there was no RSS feed for the results, I had to write code to parse the results from the html page and reformat them. This was written primarily as an exercise to see if JQuery could be used to write widgets. The answer is, it does work, but requires me to work out how to tell the interface to update things like scroll bars. Initial public release. Works for the ‘normal’ Olympics. Updated to show results for the Para-Olympics.